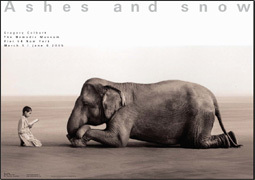 Ashes and Snow is an exhibition of Gregory Colbert's large scale photography and video, which (according to one reviewer) "evoke[s] a timeless communion between humankind and the animal kingdom never to be captured outside the realm of metaphor". Those visiting this nomadic exhibit enter a cavernous sanctuary, through the middle of which runs a narrow boardwalk atop crushed white stones. Lining the walkway at eye level are enormous sepia toned photos depicting wild animals and people together in what can only be described as a state of grace. This lengthy gallery empties into a space beneath a big screen upon which expanded video footage of some of the photo subjects is projected. Heard throughout this dramatic space is music made in the spirit of the displayed visual art. A soundtrack album of ambient music from the exhibit and video soundtrack has been released and presents compositions by David Darling, Michael Brook, Djivan Gasparian, Lisa Gerrard and Peter Cassidy among others. 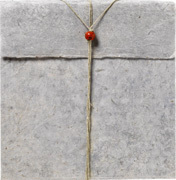 While Ashes and Snow (53'40") is unable to fully replicate the magical atmosphere of the exhibition, this compilation does bring into the listening area an element of the greater work's spirituality, and listening to the music privately away from the unique presentation space remains quite moving. A number of these works are elegant manipulations of harmony and texture by way of overtone singing, string ensembles and the occasional synthesizer and seem reassuring and contemplative. A few pieces with overt percussive elements provide the tension of directed energy and recall a more tribal spirit. Elsewhere, a track of soulful vocals with slow piano sits aside a composition for the breathy sound of the duduk as this soundtrack gently asks the listener of what meaning may lie in the beautiful melodies. The Ashes and Snow CD presents 13 enigmatic tracks of stunning music based on non-western styles and is a must-have for those interested in adventurous spiritual music; but as a soundtrack to the installation, these works reverentially augment Colbert's dire ecological premise, "in the next 25 years, the human race will have to decide whether or not to preserve the bestiary of Nature's living masterpieces. 'Ashes and Snow' is not meant to tell people to do some things or not to do other things. It's meant to inspire. I hope it's not a requiem."